In the middle of the night, depressed and crying out “Oh God, please help me, don’t let me die, please show me the way! !” I started researching, how to stop the progression of heart disease, on the internet. I found Dr. Esselstyn’s book Prevent and Reverse Heart Disease. I read it from cover to cover and committed to the whole food, plant-based (WFPB) lifestyle again over night! 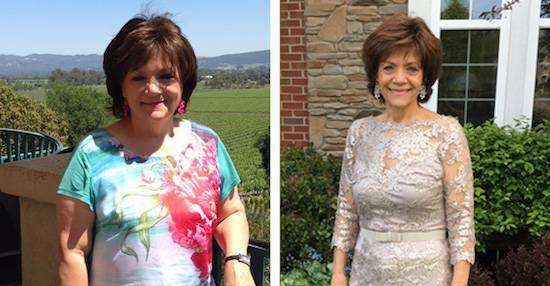 I had a love affair with food most of my entire life and I was absolutely addicted to sugar, processed foods and animal products which led me from being overweight to suffering from obesity, diabetes, arthritis and severe heart disease by age 58. For most of my life, I was at least 100 lbs overweight; yet my body was starving nutritionally and I was clueless when it came to nutrition. Most people have no idea that our food choices are the cause of most of the health issues in the Western World. In 2007, I was diagnosed with type II diabetes and my blood sugar was an incredible 441. I started experiencing shortness of breath and angina pain in my jaw and left arm. As a result, I had 5 coronary artery bypasses in 2008; two arteries were 100% occluded, two were 90% and one was 80%. They never informed me that my disease was progressive and I thought they “fixed” me. Upon discharge from the hospital, I was taking 13 pills and 2 shots a day, they told me to eat the Mediterranean diet, to limit my carbohydrates and to avoid potatoes, rice, bread and pasta. My diabetes was never really controlled the whole time because I never understood my sugar addiction until I found out that I was caught in what is known as The Pleasure Trap. In 2011, I discovered Dr. Neal Barnard’s Program for Reversing Diabetes. It worked beautifully for 18 months until I had company for Christmas and started eating the way I did for most of my life, which led me down a very slippery slope yet again. Needless to say, I fell off the wagon; I was addicted to sugar and processed foods, but I still didn’t understand, I thought I was just weak! In February 2014, after experiencing angina daily since my heart surgery, I was admitted to the Cleveland Clinic for an angiogram to evaluate the status of my coronary artery bypasses. As a result, they had to insert seven stents into my arteries; and one week later upon emergency readmission, they inserted my eighth stent into an artery which was 90% occluded. Upon release from the hospital, they told me that I had severe heart disease and all my arteries were at least 50 percent blocked …even my bypasses; and they warned me that I would be back in the hospital within 6 months with yet another cardiac event. Needless to say, I was overwhelmed and depressed, I cried for days! Shortly thereafter, I started having daily angina again, so I called my cardiologist and she told me that she could prescribe a nitroglycerin patch to ease my pain. I knew right then that they could not “fix” me! They also did a blood test for a genetic component LP(a) which is associated with heart disease. I did test somewhat positive for LP(a), so now we could blame my condition on my genetics, instead of taking any responsibility for my health situation such as my destructive eating habits. We rely too much on another pill or procedure to save us from what we have created, right at the end of our forks, every day, over decades. In the middle of the night, depressed and crying out “Oh God, please help me, don’t let me die, please show me the way! !” I started researching, how to stop the progression of heart disease, on the internet. I found Dr. Esselstyn’s book Prevent and Reverse Heart Disease. I read it from cover to cover and committed to the whole food, plant-based (WFPB) lifestyle again over night! I called Dr. Esselstyn’s office and he returned my call assuring me that it was in fact what I was eating every day that completely destroyed my endothelial cells which led to my heart disease. He told me a WFPB lifestyle “trumps” genetics; and I had to believe in him, he gave me hope when I had none! Within 2 weeks, my daily angina stopped completely! Next thing I knew I was not sleeping all afternoon as I had done for years. Then, I started walking daily and was totally committed to this lifestyle. I was on a mission to save my life! Within a short period of time, God (and a few whole food, plant-based doctors) had shown me the way! I began to come off of some of my medications starting with one diabetic pill, then a blood pressure pill and so on. My joints stopped aching…there goes another pill! It has been almost 3 years and I have not fulfilled their dire forecast, that I would have another cardiac event within 6 months; in fact, I feel better than I have in over 20 years! Remember those 13 pills and 2 shots daily? No more shots, and I only take a small dose of a statin. (Why? Because the medical community will NOT take you off statin drugs when you have known heart disease, even though my total cholesterol is only 96). Gone are the days of angina, diabetes, arthritis, neuropathy in my feet, high blood pressure, 12 of the 13 daily medications, sugar cravings and weight issues. I have lost at least 100 lbs from what I was for most of my life. I have maintained my weight without struggling with it and I don’t weigh or measure any food, plus I eat till I am satisfied. My life has completely transformed since I have adopted this Whole Food, Plant-Based lifestyle. Guess what? I eat complex carbohydrates such as potatoes, rice, whole grain pasta and bread every day for the past 3 years, which proves the point that most doctors do not understand the power of nutrition. My doctors are completely amazed and told me that less than one percent of their patients would do what I’m doing, because it is so drastic. Well, I can show you drastic from the scars all over my body from my years of surgeries. My cardiologist was so amazed with my progress that she notified the Cleveland Clinic media and my story was shown on local television. In March 2016, my story was shown on NBC Nightly News with Lester Holt from New York City. These days I speak at Dr. Esselstyn’s seminars for Preventing and Reversing Heart Disease at the Cleveland Clinic Wellness Center every month. My story has appeared on the Forks Over Knives website, in the Diabetes Health Monitor Magazine and is incorporated in the plant based documentary Eating You Alive [see Interview with the Director of Eating You Alive Paul Kennamer]. My story was also taped by a BBC crew for a new documentary in England on plant-based nutrition. My story will also appear in Dr. Neal Barnard’s upcoming book The Cheese Trap, and his PBS special on diabetes scheduled to air February 2017. Patricia S. is a graduate of the Plant Based Nutrition Certificate and the Forks Over Knives Rouxbe Cooking School. She is passionate about helping people feel empowered to take charge of their life through plant-based nutrition for overcoming Western chronic diseases and to have a better quality of life.